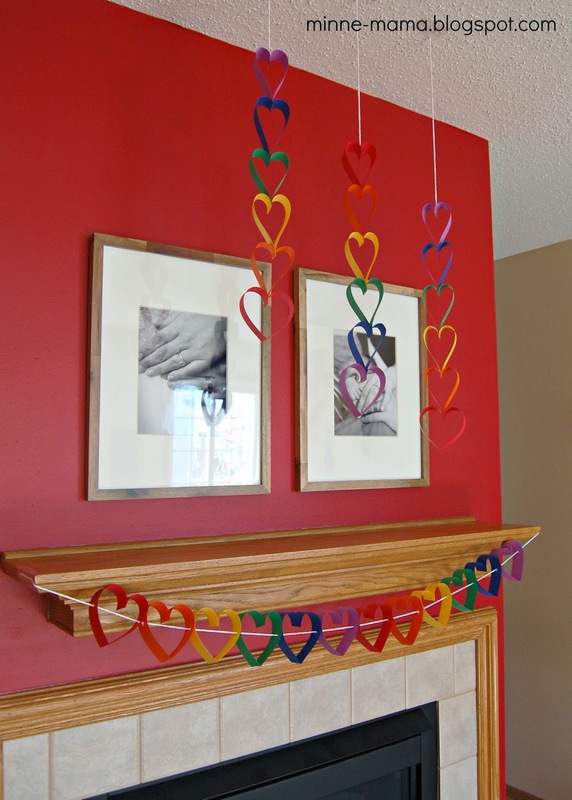 Since our heart garland countdown was taken down with Joe's return from training, I have been missing the decoration on our mantel. 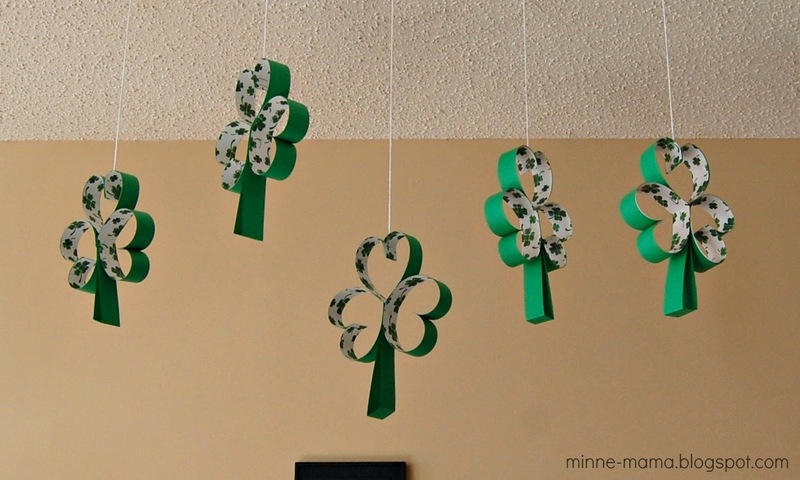 I have wanted to make a shamrock version with multiple hearts, so using various colors, I made these heart and shamrock mobiles (and a garland) as a replacement. 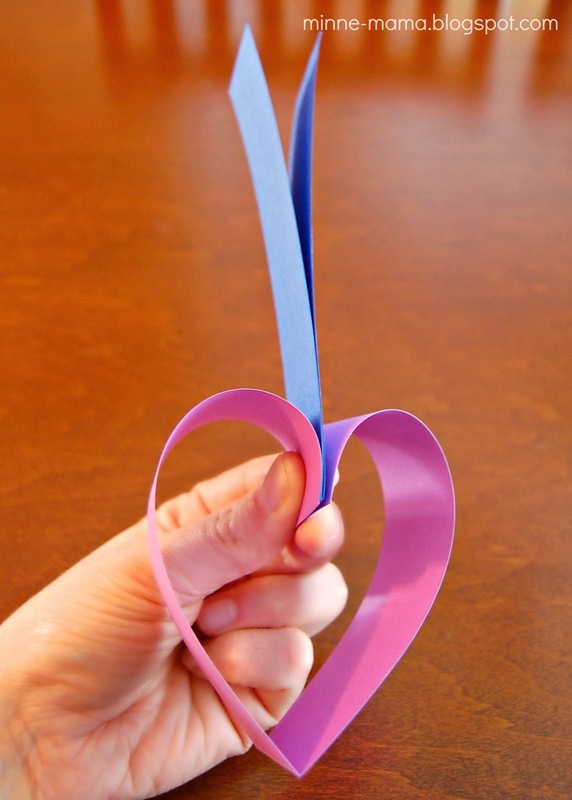 To make the heart mobiles and the garland, I cut pieces of scrapbook paper into one inch strips, and once I found a stapler that would actually punch through four layers of paper, I got to work folding them into the heart shapes I wanted. 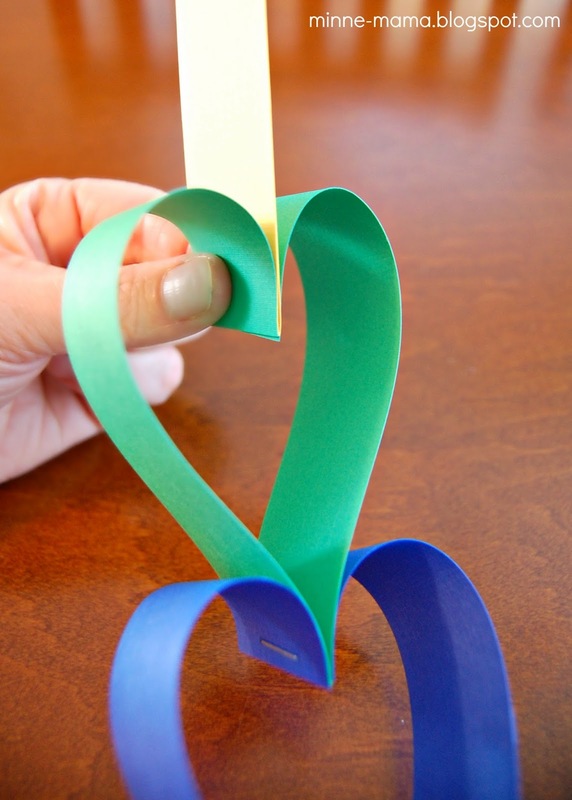 To minimize the number of staples I needed, I would fold the bottom strip of paper into a heart shape and slip the next color in between, then staple them together. 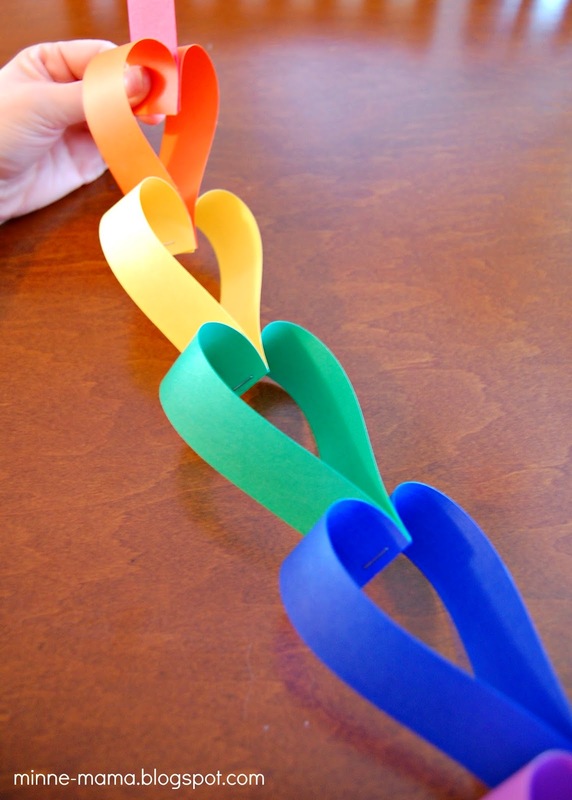 When I got to the top heart, I placed a piece of string in between and then stapled that in with the last piece. 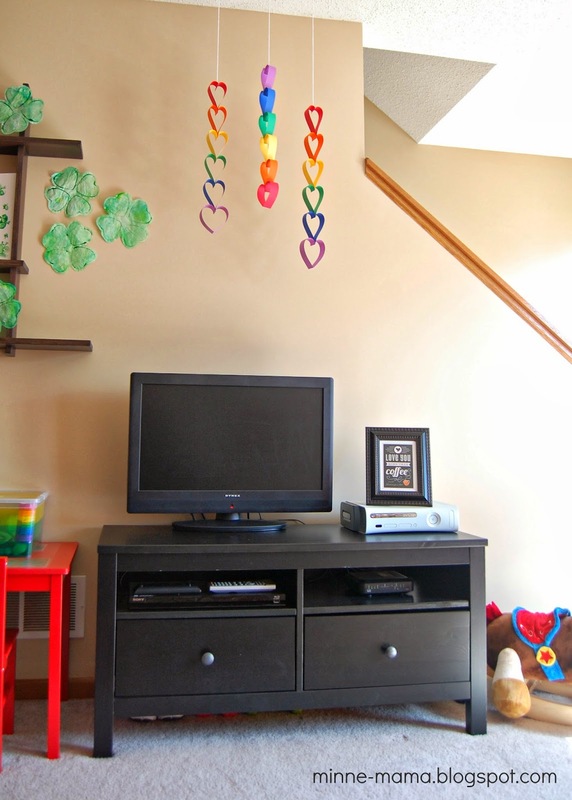 The blank space above our television got a trio of mobiles. 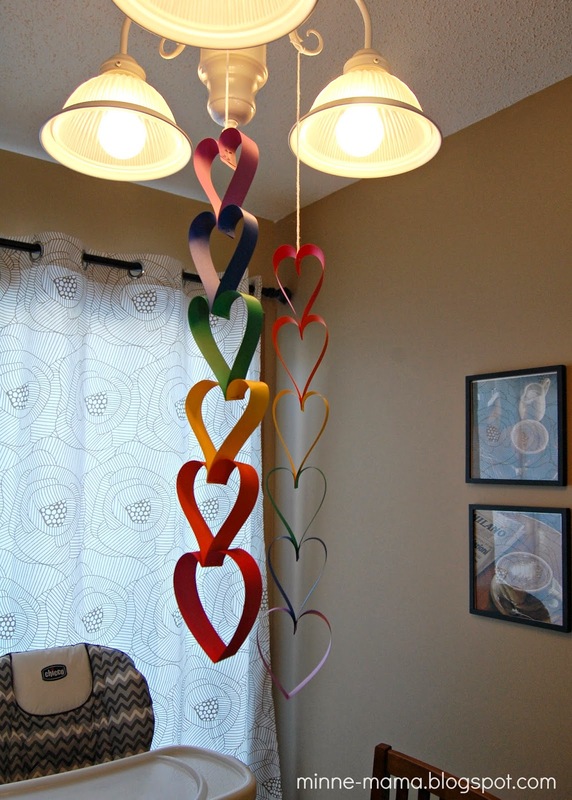 The garland was replaced with this rainbow version, except I did not need as many as with the countdown, so instead of one hole punched in each heart I strung the yarn through both sides of the paper hearts. 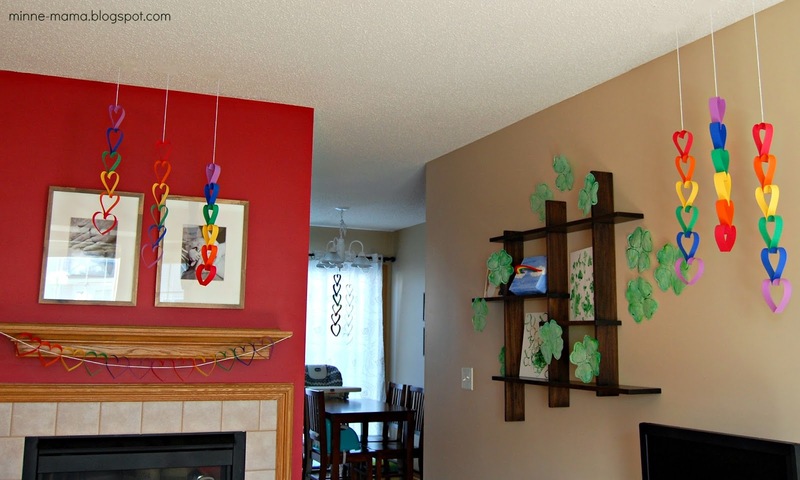 Three of the mobiles were hung, cascading, above the mantel. Our festive and colorful living room to chase away the end of winter! 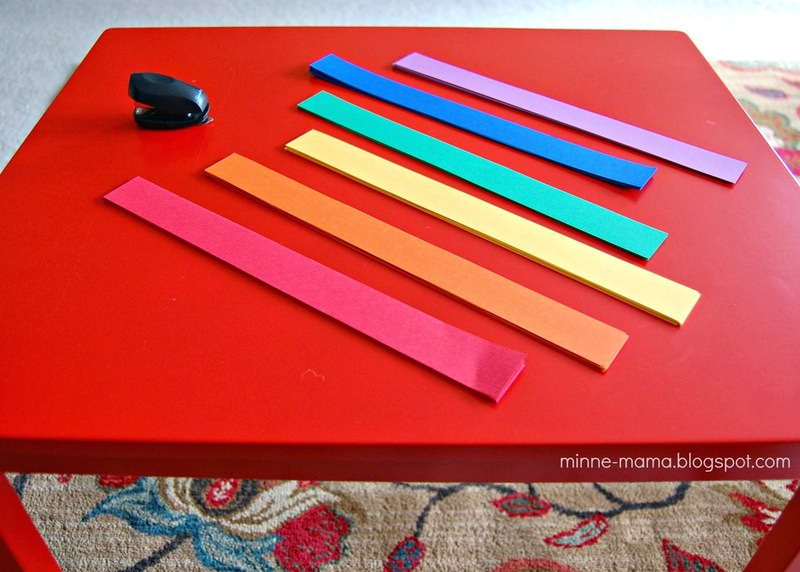 And the dining room got some rainbow colored cheer as well. 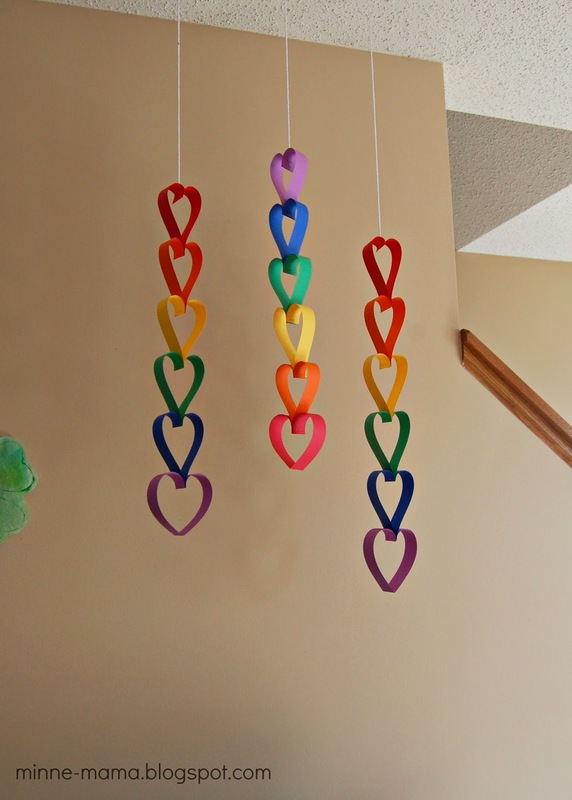 All of the heart mobiles and the garland, made with just one sheet of scrapbook paper in each color! 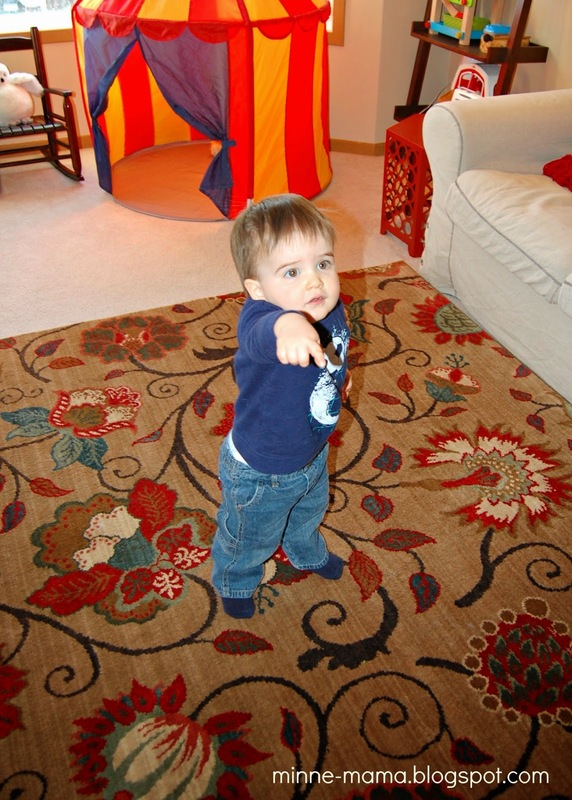 The light paper of the mobiles makes them constantly twirl, and Skyler loves to watch them move! 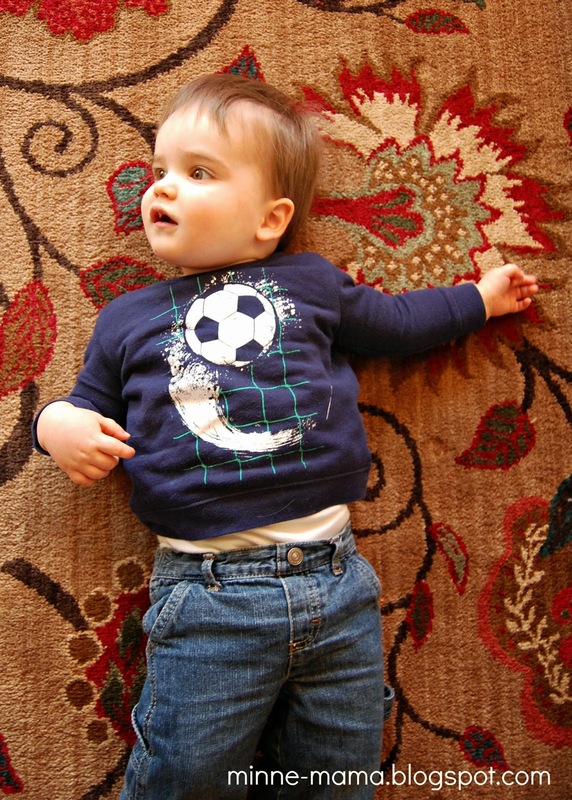 Skyler saw them all hanging after his nap, and he spent a lot of time lying down on the ground to watch them spin and saying "heart" while telling me all of the colors! 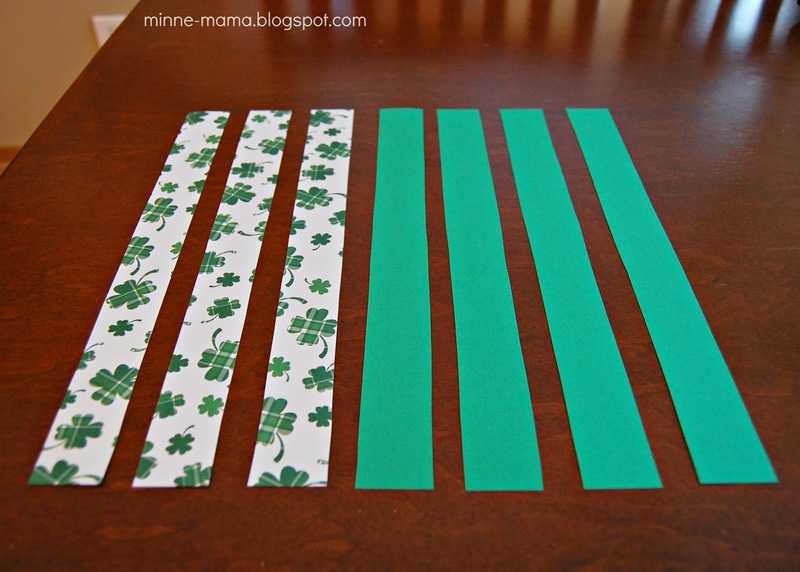 The next set of decorations used green and shamrock scrapbook paper. 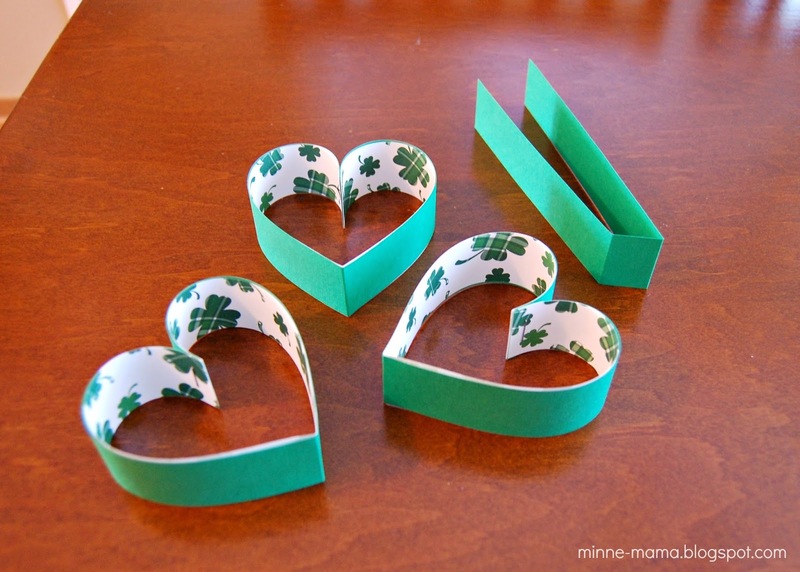 To make the shamrocks I made three hearts with green paper on the outside and the shamrock paper on the inside, facing out. 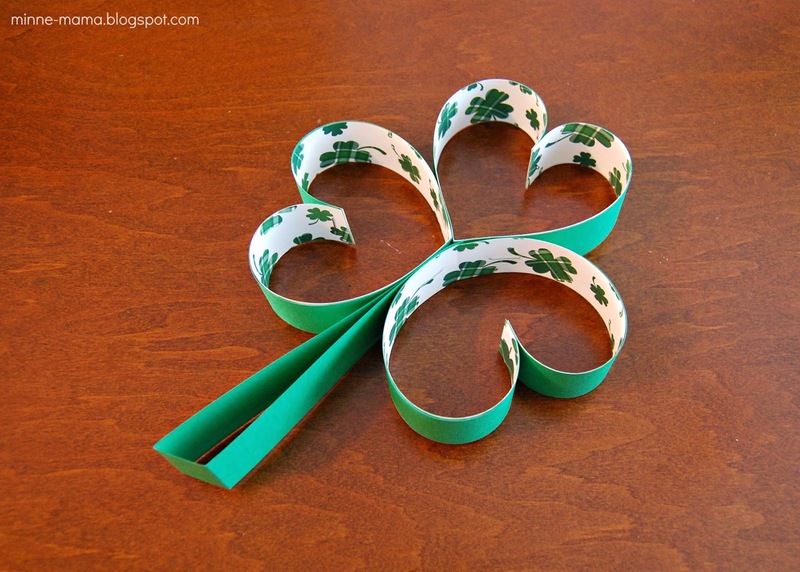 I made the stem by bending a piece of green scrapbook paper. 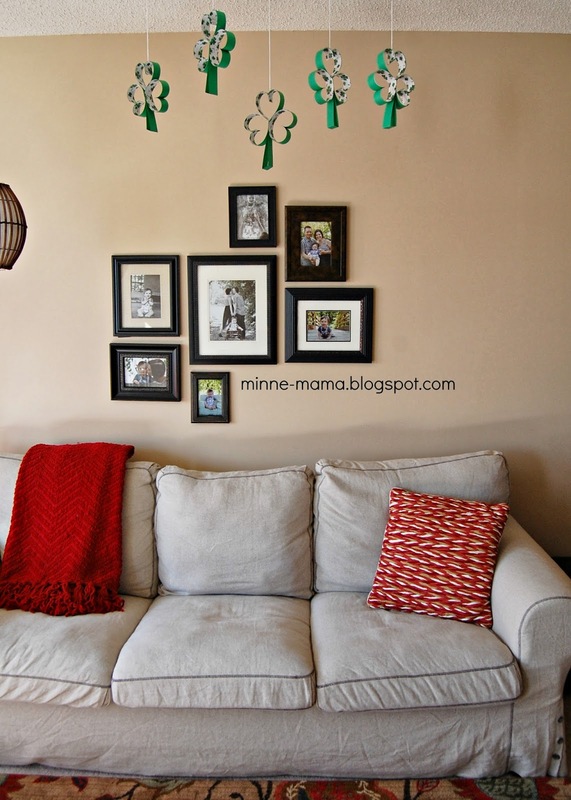 A set of these festive shamrocks was places above the gallery wall behind our couch. 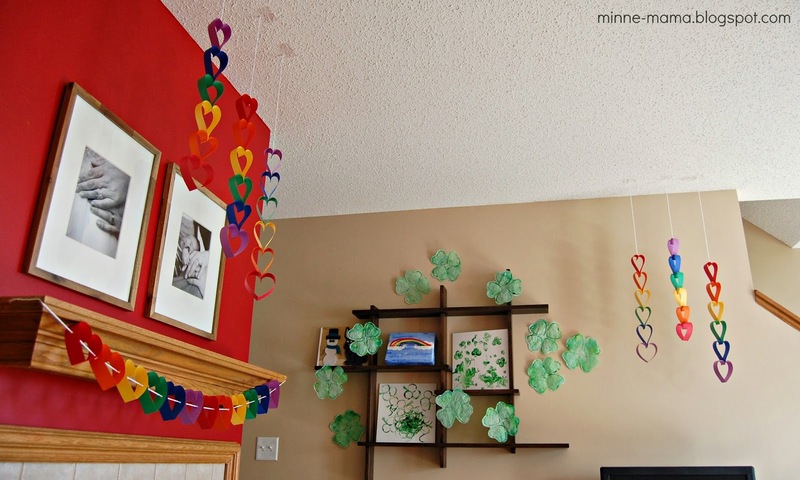 These colorful decorations are so cheerful and are a wonderful accompaniment to the "warm" weather we have had in Minnesota lately! Walks outside every day and some bright home decorations sure help to improve your mood after a long and cold winter!